Nine countries and regions, which together account for 75% of global fuel consumption by light-duty vehicles, have adopted mandatory or voluntary standards for increasing fuel economy and reducing greenhouse gas (GHG) emissions. 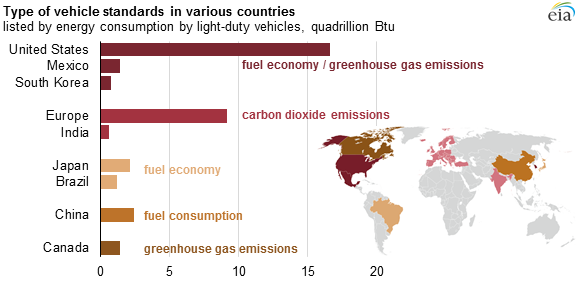 The intent and structure of these emissions policies vary widely around the world. Because fuel economy and GHG emissions policies have large effects on fuel consumption, vehicle standards are one of the most important components of future demand for liquid fuels. One area of difference is the metric specified in the standard, even though these metrics are related: fuel economy and carbon dioxide (CO2) emissions are directly related (improvements in fuel economy directly translate to reductions in CO2 emissions), and CO2 emissions are a subset of GHG emissions. Some standards specifically focus on reducing GHG or carbon dioxide (CO2) emissions, while others specifically focus on improving fuel economy. Still others focus on some combination of these objectives. Emissions reductions. The European Union (EU), Canada, and India have standards that aim to reduce emissions. The EU and Indian standards focus on CO2 emissions, while the Canadian standard includes restrictions on all GHGs. Fuel economy. Brazil and Japan have standards that aim to increase fuel economy, requiring light-duty vehicles to achieve a certain miles-per-gallon rating. Fuel consumption. China has a fuel-consumption standard that requires light-duty vehicles to reduce fuel consumption to achieve a certain number of gallons per mile. The fuel consumption standard is inversely equivalent to the fuel economy standard. Instead of increasing fuel economy, light-duty vehicles must decrease the gallons consumed per mile. Combination or option. The United States and Mexico have both fuel economy and GHG standards, and manufacturers must satisfy both. By contrast, South Korea's light-duty vehicle manufacturers have the option to choose which standard to meet, either fuel economy or GHG standard. The structure of vehicle standards also differs. Footprint-based corporate average. The United States, Canada, and Mexico have footprint-based corporate average standards. This standard sets GHG emission and fuel economy targets (in the United States and Mexico) and GHG emission targets (in Canada) based on the footprint of the vehicle, which is its wheelbase multiplied by average track width. The overall target of the manufacturer is determined by averaging the target for each footprint the manufacturer produces. Weight-based corporate average. Brazil, the EU, India, and South Korea have weight-based corporate average standards. These standards are similar to the footprint-based standard except they are based on vehicle weight. Weight-class based per vehicle and corporate average. China has a weight-class based per vehicle and corporate average standard that is more stringent than the weight-based corporate average standard alone. Light-duty vehicle manufacturers in China must meet a fuel consumption standard at each weight class level and must meet an overall corporate average fuel consumption standard. Weight-class based corporate average. Japan has a corporate average standard based on weight class. Under Japan's standard, each light-duty vehicle in a weight class must meet the standard for the weight class rather than an overall manufacture standard. Fuel economy and emissions standards are typically applied to the vehicles that a company sells within a country, rather than the vehicles that a particular country produces. For instance, U.S.-manufactured vehicles have to meet European standards for vehicles sold in Europe, and Japanese standards for those sold in Japan. Even though light-duty vehicle manufacturers have to meet different standards in different countries, as more countries adopt light-duty vehicle standards, many of these differences in standards will likely persist because of variations in policy goals and consumer preferences across countries. However, because of the global nature of light-duty vehicle manufacturing, fuel economy for all new vehicles will likely increase, and GHG emissions per vehicle will likely decrease globally under these standards.